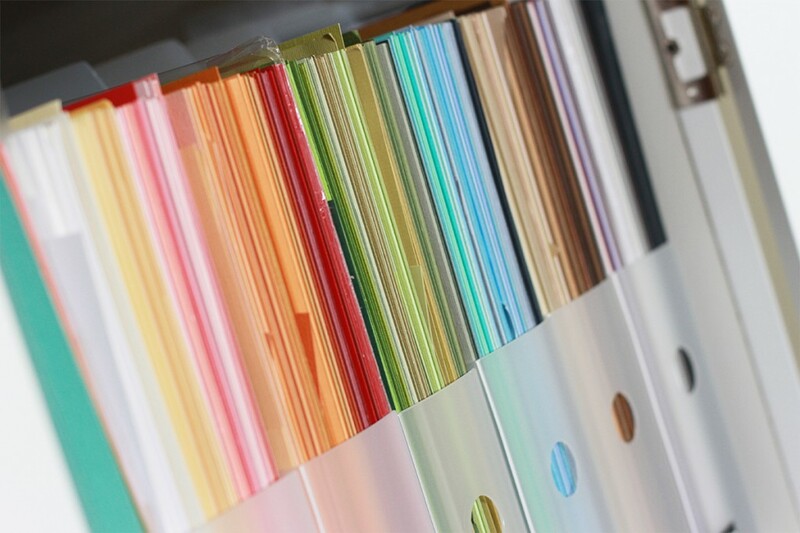 Is there nothing prettier than seeing your cardstock lined up all neatly in a row? That is an absolutely delightful sight to me! 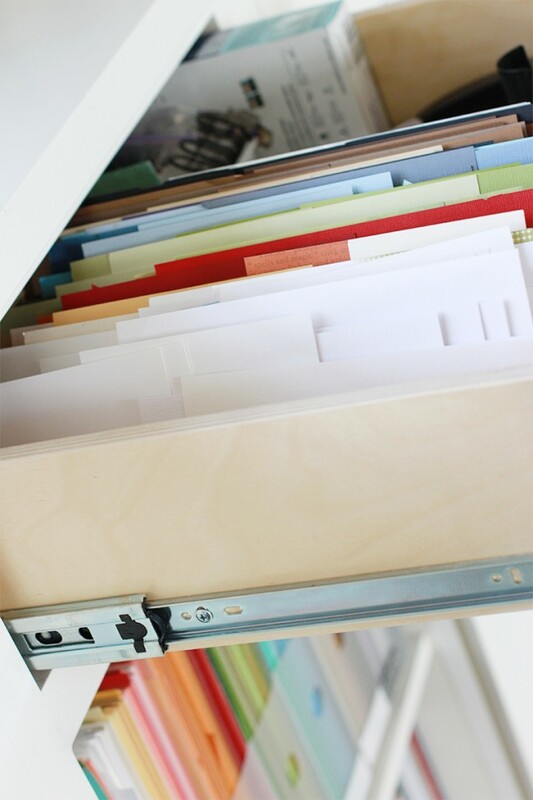 I’ve always, always, kept my paper+cardstock stored vertically. It is, by far, the easiest way to store your paper and use it. Add to it the Cropper Hopper Paper Holders and it’s complete heaven. I’ve had mine for years, so they do look a little different than what you get now. [over] abundance, I didn’t have enough. *gasp! * I know. So I had opted to take the cardstock–which resided in the cabinets above my desk–out of their sleeves so they could be used elsewhere. It was fine. It worked. Makes it not only so purdy, but convenient too! I love being able to slide those little holders of joy out and easily flip through them. Or, I even take them out completely and thumb through them as needed. I also store my Silhouette mats along side my cardstock there as you can see in the lower-left corner. Mats+Cardstock go hand in hand. And of course this all sits under the drawer with my cardstock scraps. To be honest, I don’t use much patterned paper, so most of those scraps end up going back where they belong. The cupboard to the left of this one is full of patterned paper. Well, that concludes my week of office faves. There’s no greater feeling than being organized. So far I’ve been good about putting things away as I go. I hope I can keep up that routine. Un superbe arc-en-ciel, ton rangement, Kerri !!!! I just love your organization of your cardstock. 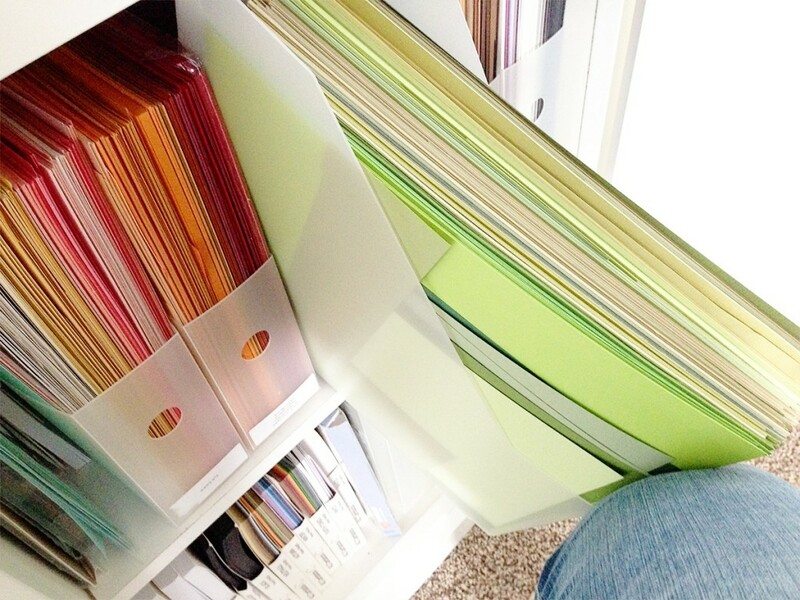 My solid color cardstock is in a Crop-in-Style storage cube in a big drawer. 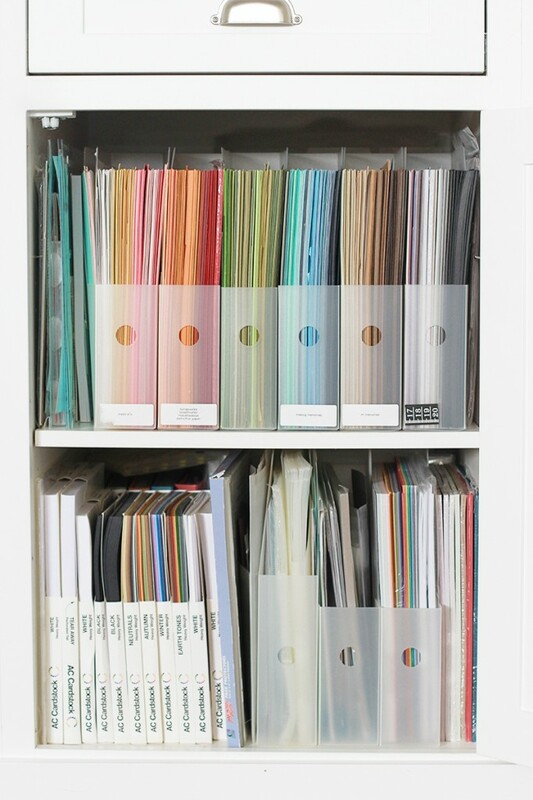 It is organized in hanging file folders. My lovely hubbie made me a standing paper sorter that I use for my pattern paper. I do not use pattern paper often, even though it looks so cute that I purchase it any ways. Grrr! :) Looking at your blog today makes me want to organize my craftroom more, but I think I will scrapbook a few pages first. I seem to organize instead of doing things with my products. Hmm? Anyone else do this? :) Thank you so much for sharing about you crafting area. What a great way to store your bits of card that are left over – I struggle with this and have even been known to throw some away because it won’t “fit” in anywhere – shocking, i know! I’m going to copy this idea = thank you so much. Kerri, I love your new space….so clean, and fresh….I also store my paper the same way, I love to look at the colors,its so easy to find what I am looking for at a glance…thanks for sharing.. I also have the same CH paper holders and LOVE THEM! I use them for both cardstock and pattern paper. Never thought about storing my mats there too…great idea!